I agree completely. I have no need for a second Karma, I have one that I love already! And I'm certainly not going to sell it to buy another one that is just a tad newer but essentially the same. But I WOULD buy a Sunset from KA, or a Surf. So if they want to tap the existing ownership base, I think you are correct - offer something different. Otherwise they are just looking for a completely new set of early adopters for the same car those people didn't buy last time around. Ditto! I would consider an Atlantic as well, as long as it has the CIU and quieter engine (exhaust in the rear) with better seating for 4 , unless it's made into 2+2. The hatch trunk is a must and better electric range with level 3 charger. +1 for me. The Sunset would have been my first choice if it had been available when I bought my Karma since I don't have much use for a four-door Saloon. Would be awesome to see it brought into production. Same here. The Sunset would get me nervous!! Totally agree. Not surf for me, but Sunset, YES! I am kinda the opposite... big fan of V12 convertibles.. My daily driver for sometime was a V12 Ferrari Daytona Spyder and that exhaust note is intoxicating. Not sure if it would be the same with the Sunset (full disclosure after that my main driver from 2010-2012 and occasionally today is a Tesla Roadster around a combined 96,000 electric miles). The exhaust note is something that I missed although the 3.7 0-60 is great. Would love VLF or some firm to release a big burly conversion of the sunset; I just don't see how the serial hybrid sound profile will work.. it is bad enough in a 4 door sedan, will be much worse in a convertible. Build the shell, let people decide what powertrain to put into it. Last edited by PowerSource; 03-31-2017 at 10:07 PM. I do rather enjoy the hum of the electric, silent speed of the newest model S with 0-60 sub 3 seconds. And my Karma alike, the hum at a standstill is a different type of aggressive sound that aids in causing the "wtf" head turns paired with the cars unique lines (we were drawn to Karma's initially for the lines of the vehicle, were we not?). It should be noted that I'm not a big fan of "classic cars" either, although I can appreciate the artistry since everything eventually becomes old. But I'd drop $120k today for a Sunset without much of a thought. Tack on a little better Stealth range versus a 2017 Fisker Karma (err, "Karma Revero" lol), and for me that's a winner. Replacing my Karma with a Karma seems silly? KA was good intentioned, but they'll need something else other than a subtle front fender update--stretching the doors and finding a way to chop the top with a hardtop auto fold into the trunk I think would do just that. I'd pay more than $120k if done right too of course, but would love to see this car made. Otherwise, if anyone knows of a shop that could piece together some sheet metal and do a conversion to a '12 Karma as a convertible, I'm all ears and would buy a second Karma to provide as the sacrificial lamb. Safety aside (airbags are gonna kill us anyway), I'd be game! But I'd drop $120k today for a Sunset without much of a thought. Tack on a little better Stealth range versus a 2017 Fisker Karma (err, "Karma Revero" lol), and for me that's a winner. Replacing my Karma with a Karma seems silly? I agree that that Sunset at $120K would fly off the lot, but considering that the Revero is offered at #135K , the likelihood of the Sunset, if it ever comes to fruition, costing less than $200K is pretty slim. I saw the Sunset prototype in person at a Northern California event and was instantly smitten, but sadly it was not to be. Last edited by Fabulist; 04-01-2017 at 12:52 PM. Truthfully, just looking at the photo I'd probably still buy that car if hovering around $150k/$160k. The issue though is once you teeter toward that $200k (unless it has a crazy performance enhancement), you're approaching that Maz/Aston tier and would go from a marketed winner to a loser pretty quick. I still think they need to make the Sunset, but they'd need the pricing to not jump beyond $150k as the challenge of it were to be a winner. 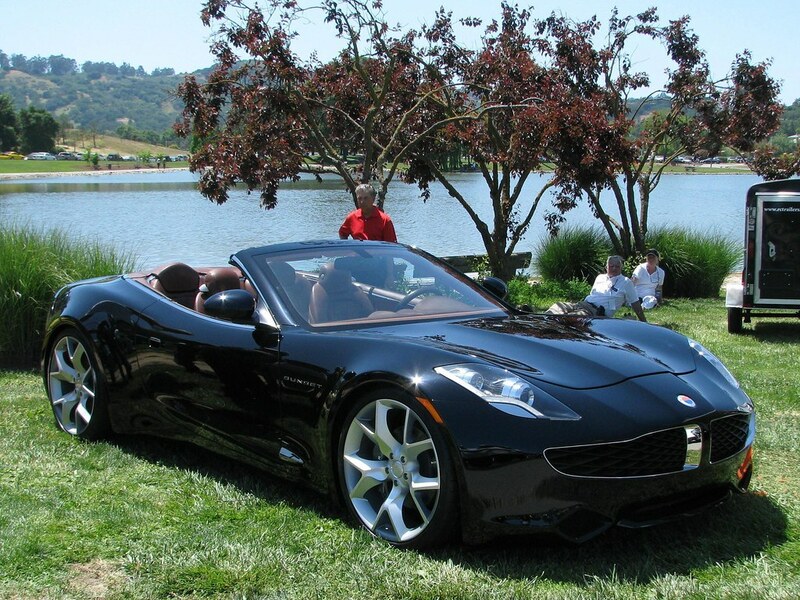 A Karma for $130k when you can still snag a 2012 model that has so few differences with less than 20k miles for $60k tells me the Revero will be a flop. If KA wanted to invest some dollars, they may be better off going to Cars.com and buying 50% or more of the inventory and scrapping them. I just don't see success for KA with marginal changes--battery consumption at minimum should have been drastically different and not just 50 miles on a charge.